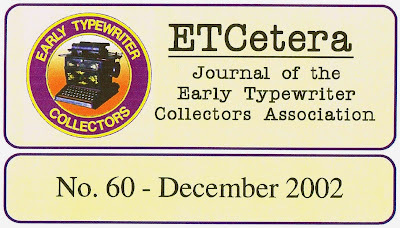 ETCetera, the journal of the Early Typewriter Collectors' Association, has twice during its 26-year history published guides (or, to be fair, "surveys") on the "Rarity and Desirability of Typewriters" - first in issue No 14 in March 1991 and the last time in issue No 60 in December 2002. These editions are, of course, downloadable in PDF form from here. However, with the growing interest in typewriters, I felt it was timely to publish in a blog post the latest list, even though it is now 11 years old. To do so, I sought and gained permission from then joint editor Chuck Dilts. In giving me the go-ahead, Chuck added the proviso that "caveats we put in there are mentioned as well (it was a group of collectors who rated them, they’re opinions based on then-current knowledge, etc)." I have scanned in the pages exactly as they appeared in print. Like many Typospherians, I am constantly being asked to evaluate typewriters, something I refuse to do. In my opinion it is impossible to put anything even approaching an accurate price on a typewriter (usually sight unseen) and that to attempt to do so is more likely than not to lead to tears. For one thing, prices on particular models will vary considerably from country to country and what may be "rare and desirable" in Australia may be considered far from either in Germany or the United States. What may be seen as well worth restoring by someone in the US may be thought to be a bit of disposable old junk by someone in New Zealand. 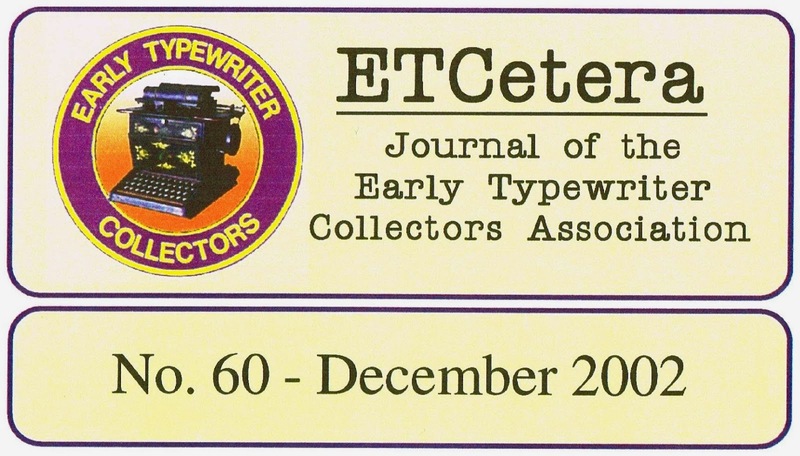 While this 2002 ETCetera list may be, in some regards, long out-of-date, it nonetheless offers owners of truly rare typewriters some guide as to a broad value of their machine: in other words, a "ball park figure". Other optimistic typewriter owners may also, hopefully, discover that a 1972 Nakajima does not rate a mention here. 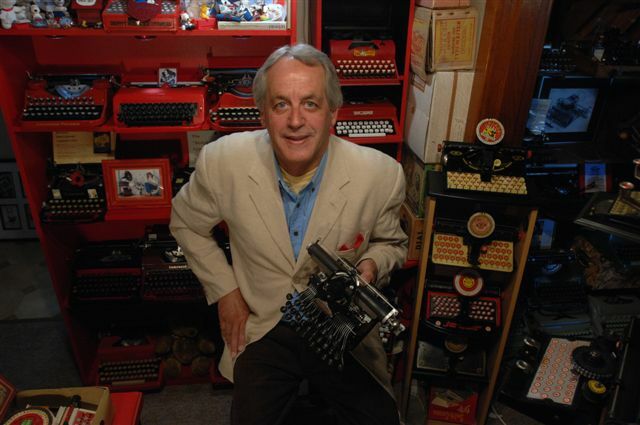 Attempted evaluations of typewriters have appeared in at least three books, Michael Adler's Antique Typewriters and Darryl Rehr's Antique Typewriters (same title, same year - 1997) and Thomas Russo's Mechanical Typewriters (2002). Quite apart from these now being completed outdated estimates - and therefore figures which should be very readily discarded as guides - some are so ridiculously high or low as to be laughable. Adler, for example, suggests you might buy an Ingersoll for as little as $100 and a Masspro for $20. Ha! I wish! On this list, published just five years after Adler's book came out, the Ingersoll has a rarity rating of 9 and a desirability rating of 6.2, and a Masspro is at 6.6 and 4.7 respectively. As a rule of thumb, a 6.6 rarity and a 4.7 desirability is highly unlikely to be found for $20, nor $200. If anyone does find a Masspro for $20, please let me know ASAP. At that price, it would almost be worthwhile flying to Germany to pick it up. The book figures were discussed at some length at Herman Price's Typewriter Collectors' Gathering at the Chestnut Ridge Typewriter Museum in West Virginia last month. One collector recalled, "When I started collecting, back then, I took a figure from Adler's book, one from Rehr's book, and settled on a price somewhere in between. I found that to be quite accurate." In many hobbies there are price guides that help manage the market and provide a sensible pricing strategy for newcomers. I have collected furniture and other things and having a good guide can help price negotiations. We have seen the effect of typewriter mania in Craigslist and ebay. I think it's time for the hobby to have a good, modern price guide. The ETC guide is certainly a good starting place. 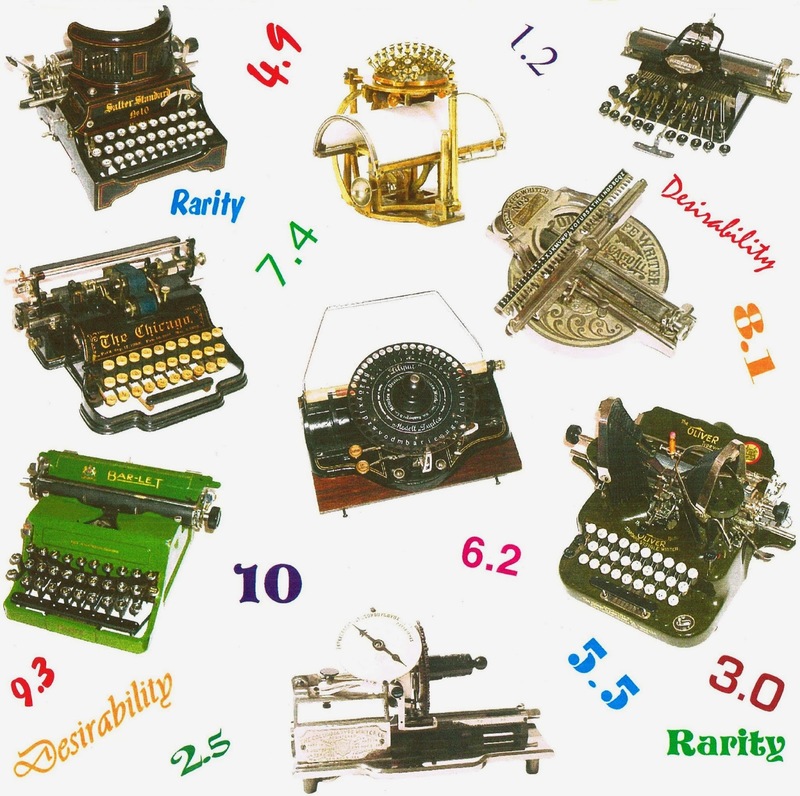 Ryan has approached me with the idea of adding a sort of price/desirability index to the typewriter database, inspired by this article. I previously considered this task somewhat unachievable for the reasons that Mr. Dilts expounds in his article, and the feeling I've gotten that typewriter collectors seemed generally unwilling to be forthcoming about the prices they paid for machines unless it was a really smokin' deal. That said, it would be fairly trivial for me to add fields to the database for collectors to include "price paid" and "desirability" - the first, if averaged over a large selection of like machines, might be handy - and the second might be useful if only to generally indicate how favorably the average collector regards certain models. It's an admirable idea and my first reaction is that it might take some of the heat off those of us who get bombarded with requests to evaluate typewriters sight unseen. Lynda Breckler has a page of "Online News" and typewriter sales each quarter in the Typewriter Exchange, but I think it is fair to say this is more for true antiques and higher-priced machines, and not a huge number of those come up for sale. I'm not on the Yahoo forums, but I know there was an attempt at one stage some years ago to list items being sold - again, I think in the same "rarities" category. As I see it, the problem (or should I say the need) is in the area of the more common-and-garden typewriters, the ones that are popping up on eBay very regularly - mostly post-war machines, but not always. Be aware, however, that what a Rheinmetall will fetch in Germany is a lot different to what it will fetch in the US or Australia, and what a Royal will fetch in Australia is a lot different to what it will go for in the US. That would be one big handicap, I should think. I?ve been having this problem too. The Mexican typewriter market has exploded in the past couple of weeks, to the point that, where I was able to buy a nice and functional Selectric II for a mere $150.00 mexican pesos (around USD $10.00 at today's exchange rates), these days the same machines are being sold for 500 - 1000 pesos, sometimes with accesories. Still not as expensive as a more classic machine, but more expensive than I paid for mine. What people has asked me often is about the RANGE of prices for machines like the Olympia Traveller DeLuxe or the Olivetti Lettera, which are, like Robert said, very common machines around here. In that case the answer is usually simple: price is determined by supply and demand, so I usually suggest them to check the online markets or put the machines in auction with a reserve price around $500 pesos or so. I've had the same problem with other items, too - for some odd reason people has been taking old cameras to my shop to see how much they're worth. In those cases it's been useful checking not only in the e-marketplace but also in collectors' forums, auctions and non-eBay eshops. Plenty of surprises there. Finally, I agree with Robert about the rarity factor being relative. When I started collecting typewriters I hadn't seen more than 2 or 3 Olivers. Today there are around 5 of those on sale online. Same goes for things like the Corona portables or the older Remingtons. Many old machines were sold originally in Mexico and they come with the Spanish keyboard; but many more have been imported in recent years as a result of the typewriter craze and are being sold at higher prices than I think they are worth. Case in point: there's some guy selling a very battered Smith Premier with double keyboard. He's asking USD 1,500 for it. And that's before shipping and handling! In the last couple of years, I meant... sorry. It would seem that an updating of the ETCetera Rarity and Desirability survey is needed since it's been 11 years or more since the last one. I do agree that price is very subjective and can vary widely based on your location. I tend to average ebay prices for completed sales to determine a current value on more common machines. I think this will be a helpful online reference point. Maybe Alan will organize a new survey for some upcoming issue of ETCetera. Since I maintain a database of my typers, which includes the total price paid, it would be simple to update my records in Ted's database. The subjectivity of desirability makes that rating less useful and interesting to me. We all collect for a variety of reasons; rarity, perceived beauty, typing quality, color, typeface, etc., etc. For example, i would rate my Olympia SM4 high because I've been eagerly seeking its particular typeface, while another would reasonably rate it lower because it is so common. Price paid would be much more useful. I, for one, have no compunction sharing what I've paid, as I believe this is useful, or at least interesting, to other collectors. But then, my wife never reads the same blogs as I do. Interesting read! I notice some names of typewriters I haven't heard from before. @Ted: I think it would be a nice "extra" to the database. Maybe even with a dropdown menu to select the continental area of where the typewriter was bought. The desirability option doesn't ring a bell to me yet, unless it appears on some kind of "want list" in my profile.